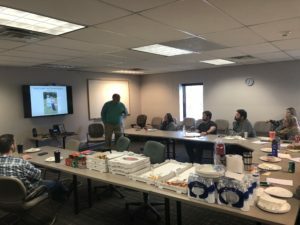 On Friday, March 15th, Moody was fortunate enough to have an old friend and mentor in to give a lunchtime presentation to our technical staff at all three offices. One of our former principals (Burt Waite), who was with Moody for over 40 years, gave an interesting and educational presentation on the historic and current uses of a Trompe. We look forward to having Burt come back in June to provide another interesting talk to our staff members.